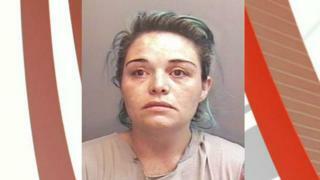 A woman who stabbed her boyfriend to death has been jailed. Lindsey Gabriel denied murdering James Field in the attack at her home in Bugle, near St Austell, Cornwall, in September but was convicted by a jury. Mr Field bled to death on the pavement outside 31-year-old Gabriel's house, Truro Crown Court heard. Gabriel claimed she could not remember what had happened and said Mr Field had stabbed himself. She was jailed for life with a minimum of 14 years. During a row on 28 September she made a 999 call during which she repeatedly shouted "get out of my house" and then told the call handler "he's stabbed himself", the court heard. Prosecutors said Gabriel had stabbed Mr Field, 35, to death with a kitchen knife because she believed he was cheating on her with another woman. The murder weapon was found by police down a drain. Sentencing, Mrs Justice May said the pair has been in a "tempestuous" relationship for five months before the fatal attack. She said recovering addict Mr Field "had his demons" while Gabriel had "variable temper with overlying mental health issues" and was "by some measure the most aggressive person there". Det Insp Stephen Hambley, of Devon and Cornwall Police, said the jury had faced a challenge as Gabriel "was unable or unwilling to help around the full circumstances of James Field's death". Mr Field's family thanked police for their support and "members of public who came to the aid of James and attempted to help him at the scene". They said: "Although we can't bring back James, we will continually miss him every day."